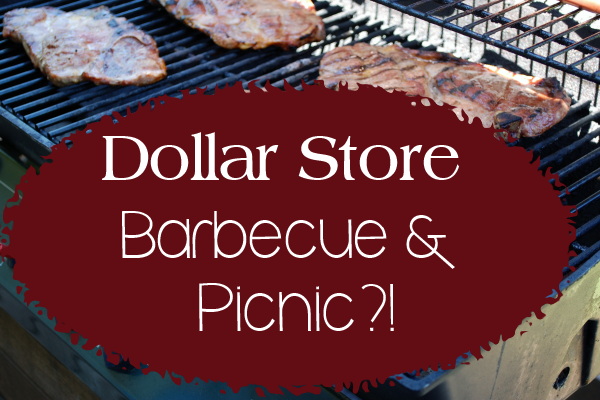 Dollar stores barbecue & picnic: Boom or bust? I recently learned about Man Crates, a cool gift box service just for guys, and also heard about their current promotion celebrating National Barbecue Month by encouraging people to share their creative barbecue ideas. Many folks plan outdoor events this time of year – whether for grads, dads, Memorial Day or July 4th. I thought it would be fun to see what kind of barbecue/picnic meal I could put together using only items purchased at dollar stores, specifically, a nearby Dollar Tree. The newer style Dollar Tree stores are a far cry from the smaller dollar stores that have been mall staples for decades. Dollar Tree’s next generation stores are huge in comparison and set up shop in major strip malls. In addition to their stock of cheap toys, batteries, sunglasses and toiletries, they also offer frozen and refrigerated foods and a wide array of nonperishable grocery items. Dollar Tree occasionally includes a full-color circular in the Sunday newspaper, and when I saw ribeye steaks in their recent ad, I knew I had to try them, just out of curiosity. I managed to fill up my cart with a variety of picnic and barbecue items – more stuff than my family could eat at one sitting. Some people count places like Dollar General, Five Below and Family Dollar as “dollar stores,” but I consider dollar stores only those that sell everything for $1 (or less). Here’s a description of what I bought for my dollar store picnic, and what my family thought of each item. As with most everything else at Dollar Tree, each item cost $1. Value: Not a bad deal, especially if you don’t want to have to wait for chips to be on sale at the grocery store, where you might be able to snag a larger bag for about $2.50 or $3. Value: A tub of dip for $1 is a pretty good deal, or would be if it was tasty. Since this dip left something to be desired, I’d recommend waiting for sour cream to go on sale for about $1 at a grocery store and buying a box of dried onion soup (three envelopes) at Dollar Tree for $1. Then, make your own delicious onion dip. 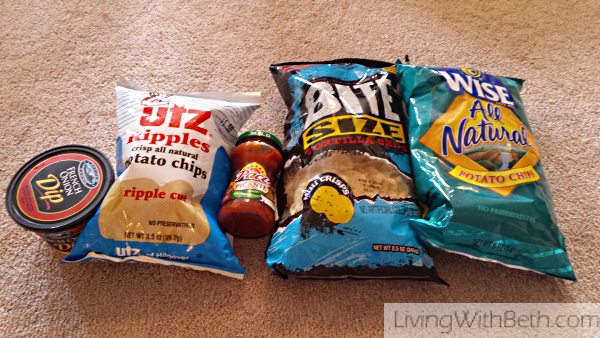 Review: My husband thought these were good, but he’s already familiar with Wise chips and wasn’t surprised that he liked them. My older daughter also thought they tasted great. Value: This isn’t a very large bag, but to get a comparable deal at a grocery store for a name brand, you’d have to wait for a sale and have a coupon. Value: Not overwhelming, either. You can often get a jar of Pace or other name brand of salsa or picante sauce at a grocery store for about $2 on sale, for twice as much product, with the store brand often sporting a regular price of about $2 for a 16-ounce jar. This is a fair price, though, if you don’t want to buy store brand or wait for a sale. Value: $1 for a 5-ounce bag of tortilla chips is so-so, since much larger bags at the grocery store go for about $2.50 to $3.50 on sale. Review: I found this mustard tasty, with just the right amount of bite. It would make a delightful addition to your barbecue or picnic. Value: A full-size bottle of horseradish mustard for only a buck is a pretty good find, though you might see store-brand fare on sale for a dollar on occasion at the local grocery store. Review: It looks like cheese, tastes kind of like cheese, but apparently doesn’t come close enough to actual cheese to have the word written anywhere on the package. It wasn’t bad, but definitely didn’t melt easily like real cheese or even “cheese food” or “cheese product,” and seemed a bit gummy. Value: $1 for a pack of something resembling cheese is a fairly decent deal, especially if you’ll be putting it on burgers for a crowd. 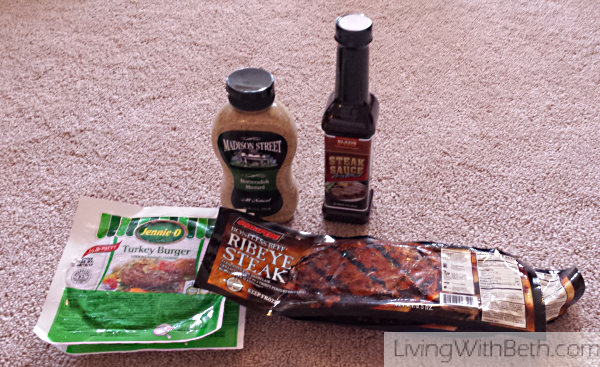 Review: My husband and I thought this steak sauce was too runny and a bit too sweet. It’s no A1 sauce, but it wasn’t bad and serves the purpose. Value: It depends on how particular you are with steak sauce. You can occasionally score a good deal on A1 sauce if it’s on sale and you’re lucky enough to have a coupon. Sometimes, stores run sales on their own brand of steak sauce for about $2, but they’ll probably have the same issue with sweetness and consistency. Review: My husband wasn’t impressed with these pickles, describing them as a second of sweetness followed by nothingness. Value: Unfortunately, there’s not much value in a jar of tasteless pickles, regardless of price. Review: Whether you like a certain barbecue sauce or not is so subjective that it wouldn’t be fair for me to say one is good or bad unless it was really god-awful or heavenly. I’m not terribly selective about bottled barbecue sauce, but Bull’s Eye is a name brand with a good reputation. Value: $1 for a full-size bottle of name-brand barbecue sauce isn’t bad. For a better price, you’d probably have to wait for a sale and have a coupon available. If you’re devoted to a certain brand, though, you may want to pony up the extra dough and buy it at your local grocery store. Review: The $1 frozen ribeye steaks are what piqued my curiosity and gave me the idea for this blog post. I wasn’t expecting much, given that they came from the freezer section of the dollar store, so I wasn’t surprised to read on the packaging that they might contain up to 30 percent liquid additive. Yep, they’re apparently watered down steaks. 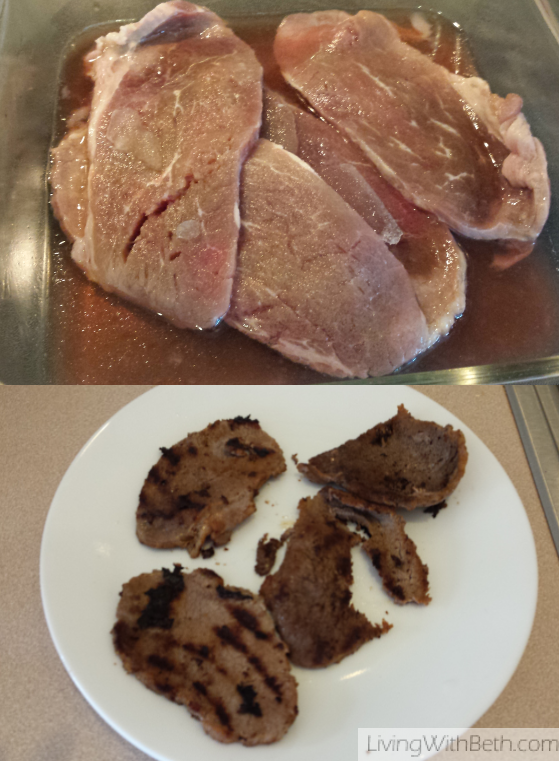 After microwaving four 3.5 ounce steaks for a minute to thaw them, they were much smaller and swimming in liquid. They were way too tiny and thin to cook on a grill, but my trusty grill pan did the job. After cooking, the steaks were too small to call themselves steaks. While they didn’t really taste bad, they were rather tough and barely large enough to fit on a normal size hamburger bun. My husband’s recommendation: You’re better off buying a McDonald’s burger off their dollar menu. Value: If the steaks didn’t cook down the approximate size and thickness of a credit card, they might be okay. What you get with these, though, is barely a buck’s worth of so-so meat. But, as I mentioned, steaks from dollar stores didn’t give me high expectations. Review: I’d never tried Jenny-O turkey burgers though I’ve seen them in grocery stores. As with the steaks, these were too thin to cook on a grill. I prepared them using my grill pan and found them quite tasty. Before cooking, I seasoned them lightly with salt and pepper, like I would with a beef burger. Value: $1 for a single 1/3 pound (a little over 5 ounces) turkey burger actually isn’t a bad deal. Jenny-O turkey burgers sell for substantially more per ounce at their regular price in grocery stores. Frozen turkey burgers in general rarely go on sale for less than 25 cents an ounce. Unfortunately, they probably wouldn’t work very well for a barbecue, since they seem like they’d fall apart on the grill. Review: My older daughter found these frozen treats delicious. Her only beef with them is that their packaging describes them as “rainbow,” but they only have red, white and blue colors. Value: Kids will appreciate this cool treat, and $1 is a decent price. They all disappeared from my freezer within 24 hours. 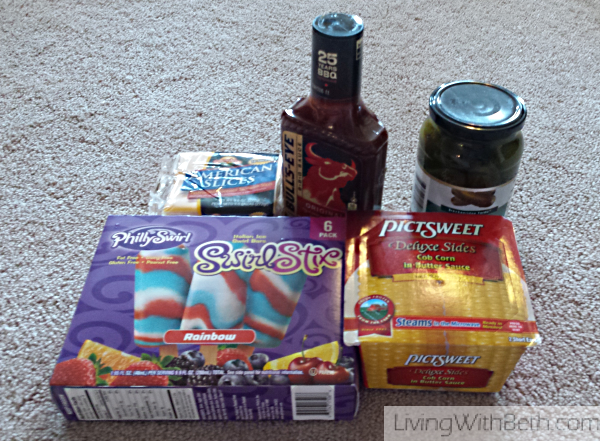 Review: Pictsweet is a big name brand in frozen vegetables, and their products are always high quality. The boxes are microwaveable for quick preparation. Value: This is a pretty small portion size to cost $1 (50 cents per ear), even for a brand name. Full ears of corn cost that much or less when they’re in season. You can probably find bags of frozen mini ears on sale in quantities of six or 12 for around 25 cents per ear. You also wouldn’t want these single serving, microwaveable boxes on a picnic unless you had time to cook them all ahead of time. Bottom line: You’ll want to stick to the grocery store for your meat, pickles and produce when planning a barbecue or picnic. For snacks, condiments and picnic supplies, though, dollar stores let you snag some outstanding deals without waiting for a sale or searching for coupons. If you’re tasked with bringing snacks, tableware or condiments to a barbecue, you should definitely check out dollar stores.